RSS feeds. Their popularity may have peaked a few years ago, but they’re still an important part of any website. 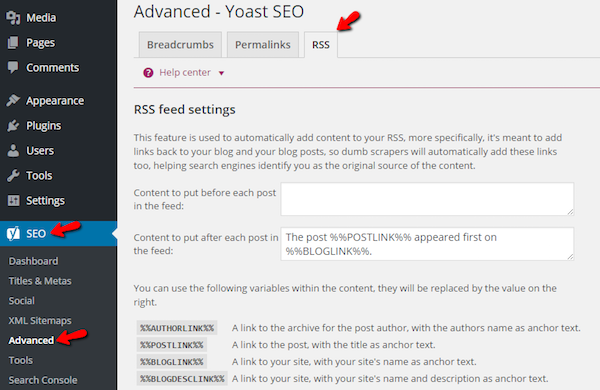 RSS feeds allow you to distribute and manipulate WordPress posts in some helpful ways. And if you extend their functionality with plugins or third-party services, you can get even more creative. So whether you’re a total beginner or a regular feed subscriber, check out this post as I take you through how WordPress and RSS feeds function together. RSS, short for Rich Site Summary or Really Simple Syndication, is essentially a way for programs to tap into a site’s content in a quick and easy manner. In fact, you’ve been exposed to RSS whether you knew it or not. The most common use of RSS feeds is for readers to subscribe to a website’s content with something called an RSS reader. Readers can make their lives easier by collecting RSS feeds from all their favorite sites in one place. There used to be a popular service called Google Reader which made RSS easy for everyone. Google has since killed that project due to waning interest, but RSS still remains a viable way for consuming content thanks to services like Feedly. RSS isn’t just for readers, though. You can also use RSS to boost the functionality of your site. For example, if you ran a blog about technology and a blog about WordPress, you could use an RSS feed to display all your latest WordPress posts somewhere on your technology blog. You can also go even deeper and use RSS to set up an email marketing campaign for your users, among other applications. As long as you’re using some form of fancy permalink, WordPress always creates your main RSS feed at “yoursite.com/feed”. For example, you can easily check out Elegant Themes’ RSS feed by going here (note – raw RSS feeds are not designed for humans!). Unless you tell it otherwise, WordPress will automatically add all your new posts to this feed. Syndication feeds show the most recent X items: This setting lets you choose how many posts will display in your feed. By default, WordPress displays the most recent posts first. So, if you change this number to “5,” your feeds will include the 5 most recent posts. For each article in a feed, show: This setting lets you decide if you want to include the full post text in the feed or just a summary. If you want to force users to come to your site to read the full post, you might want to just offer a summary. This content won’t be visible to readers on your main site, but anyone getting content from your RSS feed will see it. Yoast’s suggested use for it is to combat scrapers (people who steal your content) by including a statement and link to your original post. Create a private feed that displays full content. Good if you need to give special access to someone, but otherwise only want to provide excerpts. This plugin is perfect for any site with a variety of different categories. It makes it easy to display separate RSS feeds for each category on your site. It also lets you display RSS feeds for the tags on a post, which gives users even more control over what content they get. If you’re looking to display content from an RSS feed on your own website, you’ll want to give this plugin a look. It allows you to display posts in a news style slider. The plugin displays a single post at a time, but new posts will cycle in at an interval you specify. You can check out a live demo to see how it works. If you want to display feeds from other sites, you should consider using this plugin to easily manage them. You can pull in as many external feeds as you want and quickly add them anywhere on your site with a shortcode. Do you get the idea? You can automate all your social media sharing with IFTTT recipes. Set a relevant reminder every time you publish a new post. Send a message to a Slack channel every time you publish a new post. Anything else involving one of these apps. They allow readers to easily subscribe to your fresh content. They allow you to pull in content from other websites (or display your content on other sites). By default, WordPress RSS feeds have enough functionality to serve that purpose. If you want to add to their functionality, you can do so with one of the plugins I discussed. And if you want to go even further, I recommend you dig into IFTTT. It might take some poking around to fully to grasp how the integrations work. But once you understand the concept, IFTTT unlocks a whole new world of functionality for RSS feeds. All this RSS talk has me curious – do you all still use RSS feeds for consuming content? Or do you prefer visiting sites directly? Nice post, but… What if I need to completly disable all feeds? Is there any option, even with code? There are plugins which do that. Or else you can paste the following lines of code in your Theme’s functions.php file. Great post on RSS but one of the issues that you did not address is the template code of the DIVI builder being included in the rss feed making the feed unusable, unless you create custom excerpts. That’s a very good point, Brad! Maybe we can cover that in a future post. Thanks for the suggestion! I’ll check that out. Thank you for the suggestion, Olaf! one of the biggest problems with feeds is that theme customisations and plugins can mess with the code in a feed and render it unreadable. So it’s important to make sure that adjustments to your site don’t make unwanted adjustments to your feed. Great post on RSS. I loved the way you could use RSS to automate a couple of things. The RSS aggregator is a great tool and helps me build my writer portfolio. Another way I use RSS is to link it to my Triberr account. This way whenever a new post is published, it syncs up with Triberr and the whole community or my tribe auto-tweets or shares it on Facebook based on their preference. Thanks for sharing your experiences! I use the RSS aggregator plugin for my portfolio as well. It’s a nifty (and convenient) way to compile all of your work on the web into one place. I had a very poor experience with WP RSS Aggregator’s Feed To Post paid add-on. Bought it on a holiday sale but didn’t use it until a couple of months later, after the refund date had passed.